Despite snow on the ground and a bitterly cold wind, the Sunbeam Motor Cycle Club’s classic season-opener on Sunday, March 18 brought determination by the bucketload, writes Ian Kerr. Although amber weather warnings about the ‘Mini Beast from the East’ threatened cancellation of this year’s 79th Pioneer Run on Sunday, March 18, after careful consideration and close scrutiny of Saturday’s forecast the Sunbeam Motor Cycle Club that has organised the run since 1930 decided to go ahead after all, possibly with a slightly later start time than the published 8am. The first Pioneer Run in 1930 started from Croydon Airport, but apart from a few deviations, including a brief foray into Westminster, in central London, the traditional start has always been Epsom Downs, from where the primitive veteran machines, all built before the end of 1914, head down to the coast, finishing some 44 miles later on Brighton’s sea-front Madeira Drive. Pressing on heroically, Rick Verbeeten and Steven Green push their mounts towards the snow-covered Downs. Over the years the Downs have not proved the most hospitable place to be at 6am, when the club sets up the starting gate, but this year the predicted snow and icy winds meant no starting gate – and bikes still strapped to trailers or in vans – as riders signed on before heading to the revised starting point at Pease Pottage, the traditional halfway tea stop. 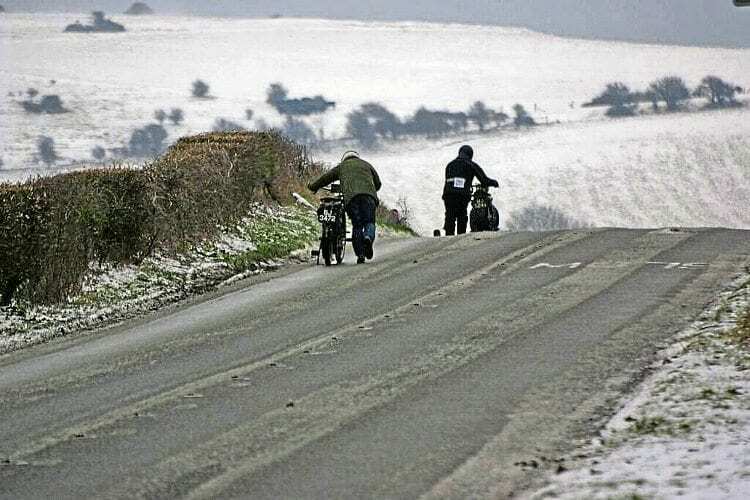 Investigation had shown that from that point onwards, the snow would be lighter and the roads not so icy – a much safer bet than waiting for a possible thaw at Epsom and a delayed start. While most were happy to take advantage of a shorter run, Fin Reynolds had already ridden his 1913 Triumph from Redhill, which normally forms part of the route, so had no choice but to start from Epsom. Having no back-up crew, he had to rely on his trusty Triumph to make the journey there and back again, but at least enthusiastic local mayor Liz Frost had one rider to flag away. She then made her way down to liaise with Brighton’s mayor at the prize giving for those hardy souls who made it.